The original post for this article can be found here: http://www.letsgraba.beer/post/118477180588/motherly-advice-from-an-82-year-old-beer-lover, a Tumblr page dedicated to the love of beer. I have been conducting anthropological research on the culture surrounding beer and will be contributing regular content to their page as a result of this sponsored fieldwork. I couldn’t be more thrilled that the first blog up is this one – in honor of Mother’s Day. I quite literally fell in love with Rita after spending a half day / evening with her – learning about her life and experiencing all the love she has to share with the world. I felt lucky to have the experience. Rita is an accomplished Antropologist in her own right – having taught Contemporary studies in a university setting, graduated with a technology degree online, published a number of books, articles (and participated in documentaries) about the Delaware Indians – who were the previous residents of the Catskill Mountains where she grew up. She told me that her parents, who “came to America from Europe to avoid becoming gingerbread in somebody’s oven” told her that the only reason they have the opportunity to live where they do is because the Delaware Indians got kicked out – and that she should make a point to give back. In addition to the many life-long accomplishments (including being a proud mother, grandmother and great grandmother) she is also an expert on beer! She’s written a couple of books on the topic and is the beloved by the brewing community in Indianapolis for her commitment to the craft and the community. She is truly the “Fairy Beer Godmother” of that town and I am proud to call her a new friend. Cheers to Rita Kohn and here’s to some wisdom through a beer lens! Rita Kohn is the Craft Beer Editor for the Indianapolis weekly alternative newspaper Nuvo Magazine and author of beer-centric books including A True Brew: A Guide to Craft Beer in Indiana. She’s well-known and adored by many in the thriving Indianapolis beer scene. Oh, and did I mention she is 82 years young? I met Rita Kohn while conducting anthropological fieldwork exploring American beer culture. Over some brews of course, we talked about the role of beer in her life and discussed its social significance as well as beer culture. 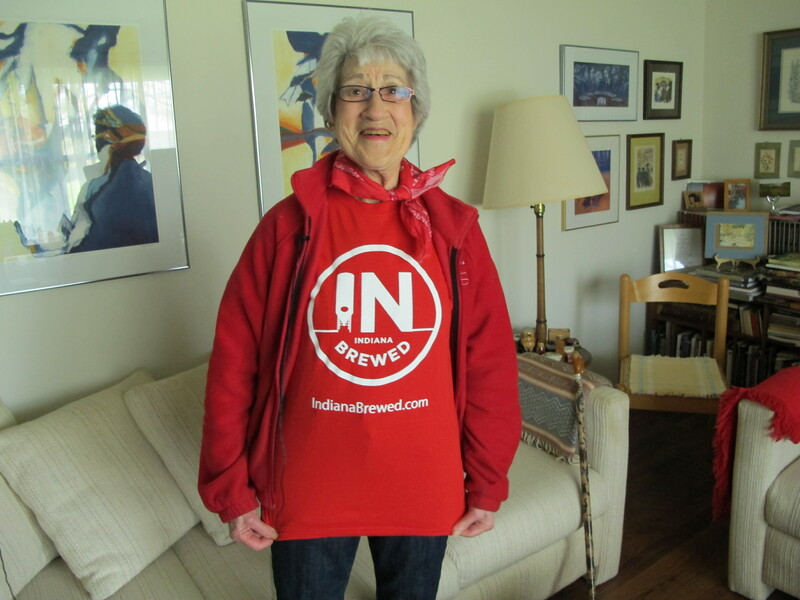 With Mother’s Day upon us, I wanted to share some life lessons as seen through the eyes of the Mother of Indy’s beer scene (and newly appointed great grandma) – who loves good beer and has lived what is above and beyond a good life thus far. Choose Lace in Life: Beer lovers know that the sign of a quality beer is the lace – the beautiful foamy formation left on the glass. Despite living in the depression era, Rita’s parents always chose to enjoy quality food and the best beer over quantity. Rita advises others to be choosy about what’s put into your body. “You get so much more out of enjoying quality food and drink in moderation than you do by over indulgence. Beer is one of those life choices – a beverage well suited to be appreciated for its characteristics and enjoyed best when savored,” says Rita. Find Your Barley: Often referred as the ingredient that brings “soul” to great beers, Rita says finding your barley – what moves you and drives a passion – is key to a good life. She points to her appreciation of local brews that feed her soul. “When you enjoy a glass of good beer, you’re experiencing the love and passion that went into its creation.” It’s an inspiring window into what living up to one’s potential can do to add value to the lives of others. Throw in Some Hops Every Day: Hops add the spice and flavor to beer. Rita’s “hops” comes in the form of immersing herself in new cultures. Rita grew up in the Catskill Mountains in upstate New York – land previously occupied by the Delaware Indians, whose culture she came to greatly respect and appreciate – having written books and participated in documentaries about their lives and culture over the course of her career. Appreciating different cultures is a big part of that adding spice to life. She points out that every time you taste a new beer, the history, heritage and culture is apparent in its flavor. *Jamie Gordon, is a professional anthropologist studying consumer culture as a strategy consultant for brands and businesses for the past 15 years. Let’s Grab A Beer is sponsoring her deep dive into the social life of beer.